The Samsung R620 is a large desktop replacement machine combining great value for money with strong performance and a Blu-ray drive. Despite the 16-inch screen sharing the same 1366 x 768-pixel resolution as the Sony VAIO VGN-NW11Z/S, images aren't as sharp. Colour reproduction is accurate enough for films and photos, but again fails to match the VAIO. The glossy Super-TFT screen is also distracting in bright light. The chassis is attractive, if a little uninspiring. Shiny plastics have been used which quickly attract fingerprints and, with slightly bendy panels, build quality isn't as good as we would have liked. Nevertheless, the keyboard has been firmly mounted on to the chassis meaning that the typing action is suitably firm. The keys are nicely spread out and travel quite far, the result being a very fluid typing experience. A sizeable numeric keypad has been provided, which is very useful for entering data. Nice design features include a watertight seal around the keyboard that protects the internal components from moisture, and also an anti-bacterial keyboard coating, ensuring germs find it difficult to breed on your laptop. The touchpad is comfortable to use and also illuminated for use in the dark. Portability is good and, at 2.8kg, this machine is particularly light for its size. The excellent 207-minute battery will also keep you productive on the go. 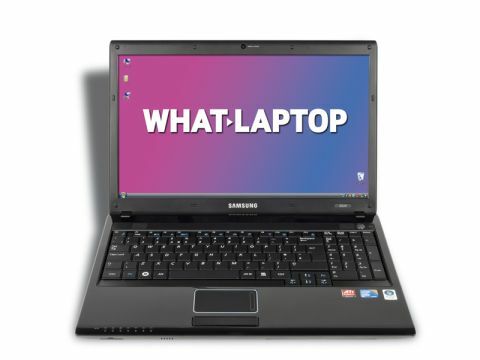 Samsung has included a powerful Intel Core 2 Duo processor and 3072MB of memory, giving the laptop solid scores when we benchmarked it against some other machines scoring 180 in MobileMark 2007. You'll be able to run office applications with ease, alongside more resource intensive programs. Although not as powerful as the Sony and Toshiba's graphics cards, the ATi HD 4330 chip here still provides enough 3D power for multimedia editing, although resource intensive games are off the menu. A further surprise at this price point is the addition of a Blu-ray drive for watching high-definition (HD) films, which is great news for the movie enthusiast. Connectivity is equally impressive, with 802.11n Wi-Fi and Gigabit Ethernet. There's also four USB ports – one capable of charging peripherals even when the laptop is turned off – and an eSATA port for transferring data at high speeds to an external device. VGA and HDMI ports enable you to hook up digital and analogue displays, including high-definition (HD) TVs. The Samsung R620's minor build quality issues are eclipsed by its levels of performance, features and value. A worthy medal winner.